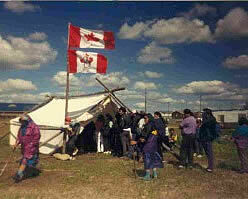 Once a year, Treaty Day is celebrated in Webequie, as is on most other First Nations. 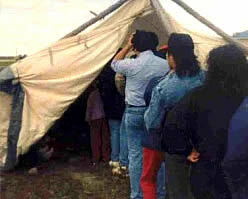 On this day, every man, woman and child in Webequie receives the sum of $4.00 from the Government. This annual payment originates from original treaties between the Government and Aboriginal First Nations. Monetarily, the annual payment is less than a pittance, and uneducated people might wonder why it is an important event. However, Treaty Day is a time for great celebration and festivities in Webequie. People look forward to the annual event with much anticipation. The reason for excitement is not the cash payment. Treaty Day is a reaffirmation of Aboriginal rights, and the promises that were made to the people many years ago. These promises should not be, and never will be, forgotten.